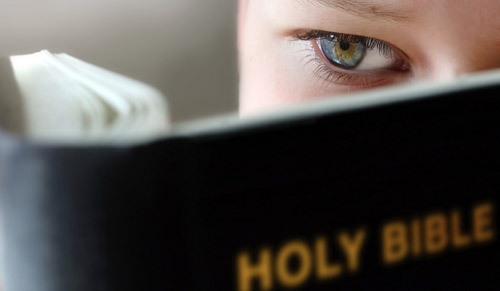 If the Bible were God's Perfect Word, would the book be one that needs a warning label to protect children and adolescents from the depravity of its content, and to warn adults of its irreconcilable absurdities? ...would it be, of all possible choices, the Bible? If it would be, you haven't read the thing. If you've read it and studied it and you actually think that's the best Almighty God can do, you're either blissfully self-deluded, a Catholic nun, a tinhorn evangelist or - scariest of all - an academic theologian. If you think that the Bible is unique in its wisdom and astonishing in its profundity, you haven't read very many books, have you? (The collected works of just one 16th Century English writer -- William Shakespeare -- rival the Old Testament in more ways than you realize. Also, by sheer volume, not to mention a sharper wisdom, the Buddhist canon --all the teachings of Buddha and his close contemporaries -- stack up to several dozen bibles.) I could go on and on, kids. WARNING: YOU MUST BE 18 YEARS OF AGE TO PURCHASE. YOU MUST BE ABLE TO DISCERN REALITY FROM FANTASY TO READ. Whenever we read the obscene stories, the voluptuous debaucheries, the cruel and tortuous executions, the unrelenting vindictiveness with which more than half the Bible is filled, it would be more consistent that we call it the word of a demon than the word of God. It is a history of wickedness that has served to corrupt and brutalize mankind.